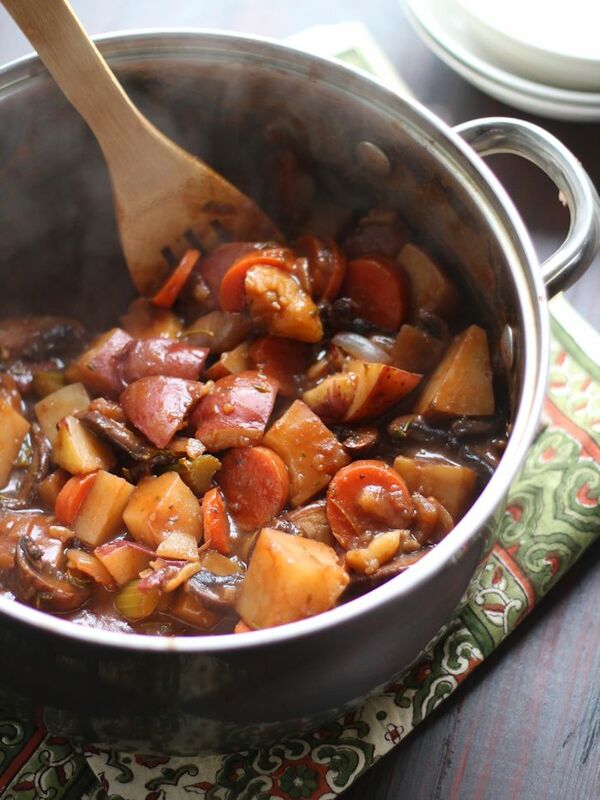 This hearty vegan beef stew uses tender portobello mushrooms in place of meat, along with potatoes and veggies simmered in a savory herbed red wine broth. It has been a weird season so far here in the northeast. Fall was freakishly mild. Christmas was downright balmy. Spring is in the air and the cherry blossoms are in bloom. In January. And it’s killing my allergies. I totally wasn’t ready for that. And then, about a week ago, I found broccoli growing in my backyard. No kidding! I didn’t even plant broccoli, at least not this year. It seems to have returned from a crop from 2014. Maybe broccoli does that? I don’t know – I’m a terrible gardener. I got really excited when I found my January broccoli, just because it was so novel and all. It was only a little bit, mind you, like one little bite-sized baby floret, but I figured I’d let it hang and see if it got any bigger. Then it turned super freezing overnight, and my little broccoli bite froze. Bummer. So it’s gone from hot to cold and back a few times since the whole broccoli ordeal of early 2016, but I’m excited to say the forecast is calling for ice pellets next weekend. I’m hoping the forecasters change their mind and make it snow before then. I know, my fellow Philly peeps are cursing me now, but I love a pretty winter snow and tend to feel ripped off if I don’t get at least one good one. Sorry! Allow me to make it up to you with this stew. I’m all about the vegan comfort food recipes this winter (a kick that started with last November’s meatloaf recipe), and this stew is no exception. You know you want to curl up with a bowl of this stuff on a snowy night that preferably happens next Saturday, right? In any event, this was delicious, and this is coming from someone who didn’t like beef stew in her omnivore days. I think it was the beef part that I didn’t like, because a bowl of steaming hot potatoes, veggies, and in this case, portobello mushrooms (in lieu of beef) in a savory red wine broth sounds pretty much like heaven to me. It was.
. I hesitated to include this in the recipe, because I know lots of people will have to seek it out or order it online, so I made it optional…but also highly recommended. I seasoned my stew with Marmite towards the end, and it was plenty delicious beforehand, but afterwards it was amazing. If you’re at all inclined, I suggest you go for it, get yourself some Marmite and cook up this savory veggie stew. 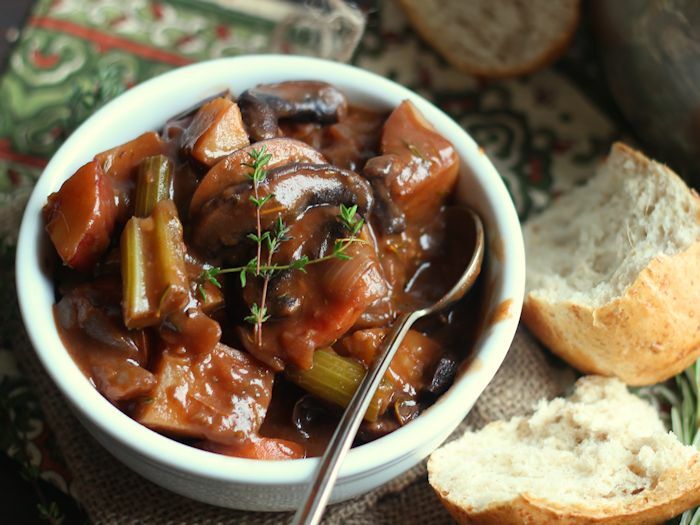 This hearty vegan beef stew uses tender portobello mushrooms in place of meat, along with potatoes and veggies in an herbed red wine broth. Coat the bottom of a large pot with oil and place over medium heat. Add mushrooms and cook until softened, 5 minutes. Add onion, celery, carrots and garlic. Cook until veggies begin to tenderize, about 5 minutes more, flipping occasionally with a spatula. Add red wine and bring to a simmer. Allow to simmer until wine is reduced by about half, about 5 minutes. Stir in flour, a bit at a time, until fully incorporated. Add broth, tomato paste, potatoes, thyme and rosemary. Stir to fully incorporate ingredients. Raise heat and bring to a simmer. Lower heat and allow to simmer, uncovered, until potatoes and veggies are soft, about 45 minutes, stirring occasionally. Add a bit more water to the pot if mixture becomes too thick and starts to sputter. Season with liquid smoke, Marmite if using, salt and pepper. Serve. Stew’s are the best comforting, warming meals. I love the flavours you’ve chosen for this dish! Marmite puts the uuumph back into being vegan, and as well as being extremely tasty Marmite has vitamin B12. Food for kings! Alisa, this looks SO good!! I grew up eating beef stew…it was always so comforting. I can’t even remember the last time I had it or even though about it honestly. But, my gosh, I MUST try this! My parents are coming in town this week and I might just make this for them! Aw! I’m sorry about your broccoli. 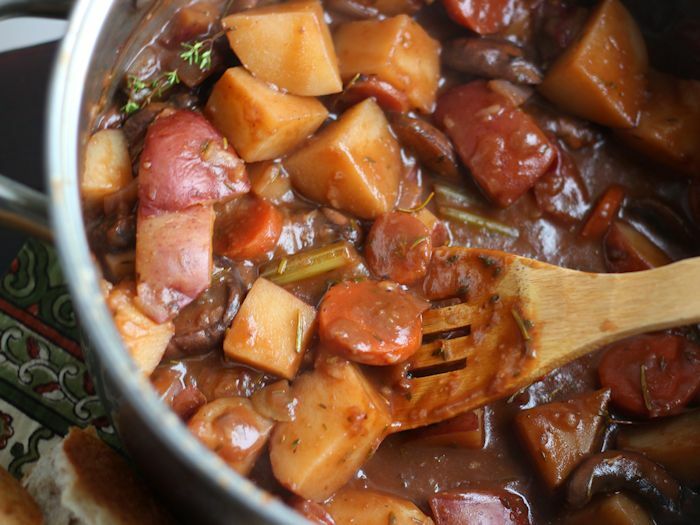 This stew looks fabulous, definitely worth hunting down some marmite for. Would miso be a good substitute for the marmite? It might work. I’d try a tiny bit at a time to see what it does to the flavor. You could also just leave it out. It will still be tasty, just a bit less savory. No, not really similar at all. Marmite taste like burnt veggie bullion. Some concentrated veggie bullion like “Better than Bullion” brand is close. Marmite, I don’t know what this is. I count on Nutritional yeast for B-12. I’ll have to get some of this and give it a try! I made this tonight and it was fabulous! I’m out of Marmite and I forgot to add the liquid smoke, and it was still amazing. The broth is so rich and flavorful (I used a miso broth). I didn’t have any thyme or rosemary so I used some basil, oregano, and sage. This one is going into my regular menu rotation! Awesome! I had a question about whether miso would work, so thanks for letting me know it worked for you. :) Glad you enjoyed this!! Never tried Marmite. Is it available locally? Sometimes if you have an “english import” or “irish import” store in the area they carry marmite too. I know that seems more specific, but you never know when people will open a shop like that. Ohhh!! Awesome idea! I’d love to hear how that works out! Works great with LBV Port. Glad to hear it! Thanks for the recommendation! 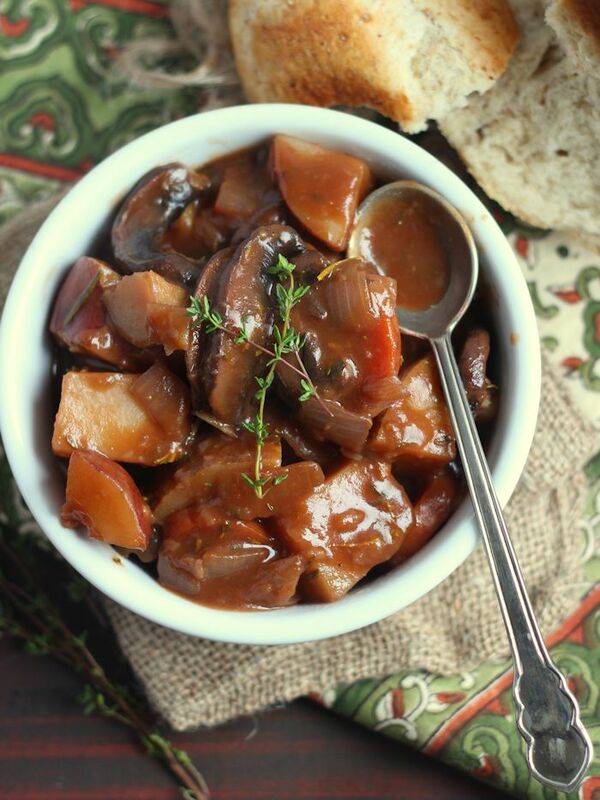 This gorgeous stew has become a staple in our wee vegan household! We use the Marmite trick for all of our pie fillings as well (the British kind, Marmite in Cherry pie might not be as scrumptious) and since we first bought a jar back in January, when we found this recipe, my boyfriend has become absolutely addicted and drinks Marmite in hot water as a broth. Glad you’re enjoying it! I love Marmite in savory dishes, and I’ve been meaning to make some savory pies this winter – I’ll have to give it a try! Just made this for our dinner, left the mushrooms out though and threw in lentils and butternut squash. Absolutely divine! Perfect recipe. Thank you! Yay! Those additions sound delicious! Glad you enjoyed it! I threw out the carrot and used sweet potatoe. Had the same effect. What an amazing recipe! I didn’t have any marmite so I substituted with vegemite instead. This will definitely become a regular recipe for us this winter. Awesome! Glad you’re enjoying it. Thanks Lani! This was amazing! My omnivore husband declared it the best soup he’s ever had! Totally a win! I found Marmite at Wegmans and used 2 tsp, magical! Forgot the liquid smoke but we aren’t fans of that, it’s so easy to overdo it. I wonder if smoke salt would work as a sub? Maybe next time. This made 11 cups, which is better for calorie counters, only 115 calories per cup, if made with no oil as I did. 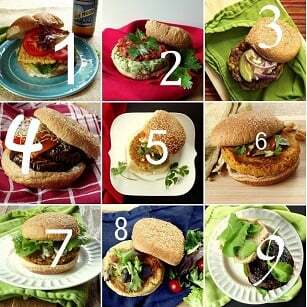 Thank you so much for sharing vthis delicious recipe! Glad it was a hit! I think liquid smoke would work as a sub too – I have a jar in the back of the spice cabinet, and I keep forgetting to test it out in some of my recipes. Next time! Thanks Beth! I had never tried marmite until tonight and think it made this much closer to a beef stew flavor (having tried the broth prior to adding it) so I’d definitely recommend buying marmite. I ordered mine from Amazon. This recipe was very good, however, we felt that the liquid smoke was too overpowering so, next time, I’ll make the soup without. When I made this, I used all of the veggies plus extra carrots, as well as some parsnips and turnips. At the end, I decided it needed something more, so I added a bit of onion powder, soy sauce and coconut sugar. My old, beloved (pre-vegan) Guiness Beef Stew recipe had a tablespoon of raisins and some caraway seeds in it so I had missed the slightly rich sweetness of that stew and felt like the addition of the soy sauce and sugar rounded it off. I would definitely make this again (without liquid smoke) and, someday, I may very well make a cross between this recipe and my old one, essentially a mushroom Guiness stew. I think with the addition of the marmite, I could pull it off without the beef. Thank you for sharing this recipe! Tried this last night- it was amazing! I didn’t use the liquid smoke or the Marmite. My husband said to put it in the favorites folder. Thanks! Glad you both enjoyed it! Thanks so much Mary! I made this today, it was delicious. I didn’t have rosemary or liquid smoke but it was still amazing. Thank you! Thanks! I’d love to hear how it turns out! One thing I’ve been craving ever since giving up meat many years ago is beef stew. It had never occurred to me to look for vegetarian beef stew until the other day, when I chose this recipe from the search results. It is fabulous – so dark and rich and beef-broth-ish! My husband loved it, too. I tweaked it just a bit to my taste, mostly by adding more carrots (stew recipes never have enough carrots for me) and leaving out the liquid smoke. The Marmite (which I happen to like) really did make the difference in taste, although it was good even without it. This recipe will definitely be made again. Thanks! This is definitely one that can be adapted to your individual tastes! Glad you both enjoyed it! Thanks Rhonda! Add maybe a drop of liquid smoke… I was tasting the soup throughout the process (no marmite) and it tasted delicious, but once I added 1/2 tsb of liquid smoke it overpowered all of the delicious flavors the soup had going for it while I was tasting. throughout. For my taste it is much better without liquid smoke just add a bunch of cracks of pepper instead and its amazing. I wanted to share this recipe with my vegan friend, but she’s allergic to tomatoes. What would be a good substitute for the tomato paste? Would cornstarch work? Oh that’s tough! I think since it’s a small amount, your best bet would be to just leave it out. It adds some flavor but I think this will still be tasty without it! At the risk of appearing ignorant – what is Marmite and where can you purchase it? My daughter shared this with me can’t wait to make it is there anything I can substitute for the dry red wine? I think you could leave it out and just use some extra veggie broth. I hope you enjoy it! This recipe sounds amazing, can’t wait to make it — I love marmite! My wife is vegetarian and this will be perfect for her. Bought all the ingredients today, plus some beefless tips, turnips, and cauliflower that I may add. One question: I’m tempted to make it in the crock pot tomorrow. Is there any reason that’s inadvisable? OR if you think that would work, are there any portions you would cook first on stove before adding to crock — or can I just dump all ingredients in at once and start it up? Same question for end — do marmite and liquid smoke need to be added after crockpot is done, or can I just add them with all ingredients at start in crock? No worries if you aren’t sure, I love a culinary experiment and would welcome your insights, even as guesses. Thank you so much!! I think you’d be fine to throw everything in at once. You can saute the veggies on the stove first if you like (I think it adds to the flavor), but honestly I usually don’t bother with that step when I make things in the slow cooker. I’d love to hear how it turns out! I was wondering if you could suggest a substitute for the liquid smoke? I have read that there are only tiny amounts of carcinogens in liquid smoke, but being pregnant and having a toddler, I would rather not risk it. I followed the recipe to the T with the exception of the liquid smoke and everyone loved it! Thank you! Oh my goodness-what a PERFECT meail for this cold, New England winter day! Thank you! I’m so glad you’re enjoying it!! Thanks Rick! This is probably one of the best beefless vegan beef soups I’ve had. I put in about a 1/2 cup of barley just because I love it so much but a carnivore wouldn’t miss the meat in this. Will make this again and again. I’m so glad you’re enjoying it!! Thanks Melodie! I just made this and it was amazing! I didn’t have vegemite so I used misogyny paste a couple tsps worked fine. Love the gravey the red wine makes it! This will be a go to for those cold winter days. Thank you for sharing! Meant to put miso lol auto correct ! Haha!! I’m glad to hear that – misogyny paste sounds terrible! And super glad to hear you enjoyed the stew! Thanks so much Cindy! I made this substituting Apple cider vinegar and veggie stock for the red wine and it was pretty amazing! The only thing is that the liquid smoke was really strong, even when I put 1/4 teaspoon. I’ll leave it out next time cause this recipe was really making my kitchen smell good! Lol! Well, I don’t really like the taste of marmine on it’s own, but it’s fantastic for adding savory flavor to recipes. :) I’ve had lots of readers get good results with this one while leaving it out though, so I think just liquid smoke should be fine. OMG this was delicious! No Marmite, but will try to find some for nest time. My guests loved it. A definite keeper. Awesome!! I’m so happy to hear that! Thanks Anne! This was delicious. Left out the liquid smoke and marmite, added a bit more wine and a lot of herbs — such a nice start of fall treat! Made this for dinner tonight. Made the recipe exactly as written. It was delicious! Will definitely be making this again in the future. Thanks for another winner! This was terrible. It was so bad I could not choke it down. I put it I a colander and washed off my potatoes to at least not waste them.. This is a fabulous recipe! Absolutely adored in our family who love it when it comes up on menu plan! My husband says it’s as good as his mum’s – high praise indeed! Thanks for producing it! Just reading this recipe made my mouth water so I made it the other day. It was AMAZING! I’m vegan, my husband isn’t but he went nuts over it. Because of his Diabetes we are trying to find tasty and healthy substitutes for red meat. This really did the trick. I didn’t have the Marmite or the red wine so I substituted with Nutritional yeast and red vinegar. I think it was just right. The gravy part of this is out of this world and it works up so easy and smooth. I really like the way this is put together and how the stew comes out so creamy and so hearty tasting. The only other change I made, and it’s strictly a personal preference for us, I added just a bit of unsweetened soy milk to lighten the gravy. All in all, this was a delightful and satisfying stew and is one of our new faves! THANKS! I’m so glad you enjoyed it! And I think adding some soy milk to make it a little creamy is a great idea. I might try that myself next time! Just transferred it into the Crock Pot. And now, we wait! Just the thing for a late supper with a hunk of crusty baguette with vegan butter…and already it’s smelling wonderful! I didn’t have portobellos or creminis, so I made do with white button, but they were fresh and plump and quite flavorful after the initial sautée. Next time, I’ll definitely go with creminis – that nutty flavor would really round this out nicely! Dang!!! Marmite is EXPENSIVE!!! $5.59 for a little 125g jar? Yikes! I’m going to have to peruse Amazon and see if I can get that price down! But then, that’s San Francisco for you! Made this tonight and it was fabulous!! Dark, rich and flavorful. The Marmite is a must! It really added that “Unami” perfection. I added a couple extra items. A handful of small green peas and a good amount of chopped scallion. This recipes a keeper! Yay!! I’m so glad you enjoyed it! Sounds like a delicious meal! I don’t have marmite so I used vegan Worcestershire (Kroger brand) and it turned out great. I also just used Italian seasoning because I don’t have plain thyme or rosemary. Next time I would change the spice profile. Instead, I would season like a Hungarian goulash, with a tablespoon of Hungarian paprika and half a teaspoon of Caraway seeds. Since people are asking where to get the Marmite, I got mine at World Market. Did you by chance substitute dried spices? They’re much stronger than fresh, so you need to cut way back (only use about one third) if substituting. This stew tastes great and is very filling. We do not miss the beef at all. When I heated the leftovers, I added some frozen corn and peas; the more veggies the better! I will feature my review of this recipe on my instagram account this week and will be sure to tag you. Yay! I’m glad you like it! Thanks Joyce! Thank you for the recipe idea. I followed the instructions to the letter, and made no alterations. The flavour components were all there, and the Marmite definitely did the trick. Unfortunately, my stew came out quite watery… More like a chunky soup than a stew. Also, I found the mushroom:potato ratio a bit out. In my opinion there should have been more mushrooms and less potatoes – especially since the mushrooms are the main ingredient (as suggested in the recipe title). Next time I will also use less veg stock.